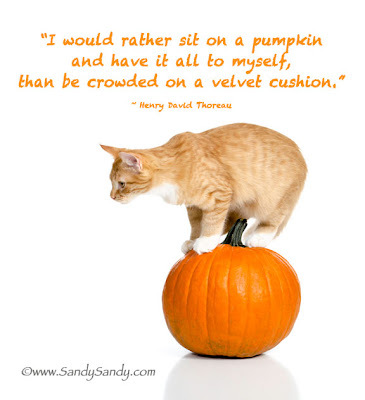 Sandy, how did you convince Opie to pose on the pumpkin? It's a fabulous photo!!! Actually it was easy. I had a hard time trying to keep him off of it! Thanks, I'll tell him you like it. Awe, tanks!! Hugs and purrs back, Auntie Kim! Love Thoreau! He's my most favorite philosopher! What a great model he is!! He's almost cuter in the photos than in real life, And he really seems to like it too. Thanks for the kind words, Robin! Thanks Sally! Yes, we caught Ja Ja and had her fixed. The kittens go in next week for their little operations. Don't need any more kittens here for a while.